Can I Go Walleye Fishing In Georgia? Walleye is the most popular sport fish in the northern states and Canada, but it remains a relatively obscure species to most Georgia anglers. With expanding populations and an excellent reputation as table fare, walleyes are gaining the attention of increasing numbers of Georgia anglers. Walleye is a coolwater fish that is native to the Tennessee River and Coosa River Valley systems that flow through the heart of Fannin, Union, and Towns counties in northeast Georgia and in Dade, Walker and Catoosa counties in northwest Georgia. Rivers with Native American names like the Coosawattee, Conasauga, Etowah, Oostanaula, Toccoa, Nottely, and Hiwasee once contained native walleye populations. Native walleye declined in the state many years ago for a variety of reasons including loss of spawning habitat and overfishing. To rebuild and expand their distribution across North Georgia, a walleye stocking program was initiated in the 1960s. These early stockings were largely unsuccessful in all but a few mountain lakes; therefore, the walleye stocking program ceased in 1968. During the 1990s, declining numbers of walleye coupled with the rapid expansion of illegally introduced blueback herring sparked a renewed interest in reestablishing the walleye stocking program. 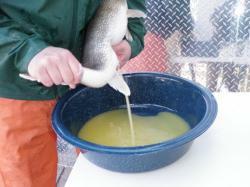 In 2002, a fledgling walleye stocking program was reborn in Georgia. Today, eleven lakes receive annual stockings of walleye. These include lakes Seed, Rabun, Tugalo, Yonah and Hartwell in the Savannah River drainage, lakes Chatuge and Blue Ridge in the Tennessee Valley plus Lake Lanier, Carters Lake, and two lakes in the Rocky Mountain Public Fishing Area. 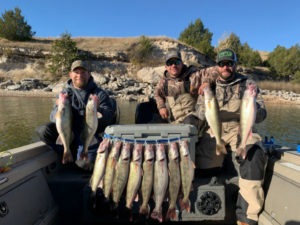 This guide was written to provide anglers with seasonal information on where, when and how to catch walleye in Georgia. GADNR staff is also available to answer more specific questions. Contact information for walleye lakes in Georgia is provided in the table below. By late-winter, the natural instincts of adult walleyes draw the population to the spawning grounds for the annual ritual of laying and fertilizing eggs. Identifying potential spawning areas is critical to angling success from February to April. For most lakes in Georgia, the major walleye spawning areas are in the headwaters in very shallow water with rocky bottoms, like the picture below of a major spawning area in the headwaters of Lake Rabun. Pre-spawn walleye stage in deeper water near the spawning grounds for several weeks while they wait for the water to reach the critical temperature of 48oF to 50oF. No fancy gear or tackle are needed to catch these fish. Simply drifting nightcrawlers slowly along the bottom through these staging areas is the best way to catch prespawn walleye. Walleye are finicky feeders and may prefer small jigs tipped with minnows or a curly tailed grub or even a crankbait, such as a sinking Rapala or Shad Rap. Maintain a slow but steady retrieve as you work these lures across the river bottom. Be patient and stay focused for a light tap or steady tug on the line. Male walleyes will be the first to reach the spawning grounds in late-February, and they will remain in the area through mid-April. At night, male walleyes will swim into very shallow water with rocky bottoms in hopes of finding a female ready to spawn. During the day, they will retreat to the shelter of nearby deeper water to avoid the bright sunshine. Female walleyes behave much differently than their male counterparts. Females will only move in and out of the spawning grounds for brief periods at night to broadcast their eggs onto the rocky bottoms where they will be fertilized by several males. When her heavy egg sac is emptied, she will leave the spawning grounds for the season. Because of the differences in spawning behavior between male and female walleyes, anglers can expect the bulk of their catch to be males that range in size from 2 to 4 lb. GADNR has been stocking walleye into north Georgia lakes since 2001. This is sufficient time to allow many females to reach trophy size. 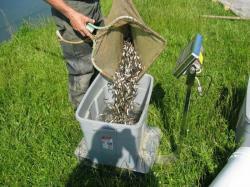 In fact, GADNR biologists have collected walleye over 12 pounds during the spawning season on some lakes. The state record was caught in February 2016 and weighed 14 lb 2 oz. From March through early-April, walleyes are easiest to catch in the evening hours when they venture into the shallows of the spawning grounds. In fact, some anglers talk about the “golden hour” right before nightfall as the time when walleyes bite best. Shallow water walleyes are most easily caught using a 3/8 oz jig tipped with a live minnow, nightcrawler, or plastic grub. Shallow running minnow imitations are also effective during the nightly spawning run. Whatever your preference of baits or lures, the presentation is similar. Cast across the rocky structure and make a slow but steady retrieve. The bite is rarely aggressive but feels more like sudden resistance. A slight upward swing of the rod is all that is needed to set the hook. Walleyes in shallow water are easily spooked, so finesse and stealth are critical, even at night. The rocky, shoal areas below the dams at lakes Burton, Seed, Tugalo, and Yonah offer easy bank access for nighttime anglers. Boats are required to reach spawning fish on lakes Tugalo, Hartwell, Lanier, Carters, and Blue Ridge. Use caution when fishing below dams because water levels may rise suddenly. Check water release schedules before your trip. After the spawning season, walleye return to the main lake to resume their daily ritual of finding food and searching for sheltered resting areas. Because walleye prefer cool water temperatures (65 to 72oF), small schools of walleye will congregate together in deeper water during the summer months where temperatures are more suitable. Walleye orient to structure, especially bottom structure, in their preferred depth zone, only leaving these hiding spots for opportune moments to feed on herring, shad, yellow perch, sunfish, and crayfish. 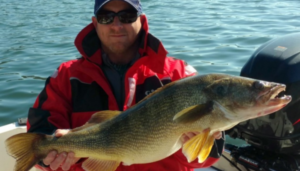 The key to successful walleye fishing in the summer is to determine areas of the lake where walleyes are most likely to congregate. In the mountain lakes, likely congregation areas occur on points and the mouth of coves at target depths that range from 15 to 25-feet in early summer and progressively increase to 30 to 50-feet by summer’s end. During the summer, most walleye can be found on the lower half the lake. The best presentation for walleye in the late-spring and summer months is a simple nightcrawler that is worked slowly along the bottom near structure. Slow trolling can also be effective under lowlight and nighttime conditions using a weighted bottom bouncer armed with an in-line spinner and tipped with a nightcrawler or lively blueback herring or even deep diving crankbaits in perch, fire tiger and shad color patterns. Long points, humps, and weed beds on the lower end of the lake are the best places to search for summertime walleyes. Structure fishing with finesse and diligence will ultimately be the keys to hooking into some walleyes during the warmer months. Several reservoirs in north Georgia are summer standouts because of their relatively small size and ease of locating deepwater fish. Lakes with excellent summer walleye fishing include Lake Yonah, Lake Tugalo, and Lake Rabun. The search for summer walleye should begin on the lower one-third of the reservoir in the mouth of coves, on long points, or around any deepwater structure. There is one unusual twist to the traditional summertime, deepwater pattern on these lakes. After heavy rain events, walleyes will frequently move into the shallow headwaters to feed in the fast-flowing, turbid waters. These opportunities are unpredictable but worth taking advantage of when they occur because the walleyes that move into the shallows are generally big and hungry! When the tree leaves turn colors during the cool days of October, walleyes emerge from their deepwater refuge to search the shallows for unsuspecting prey. During the fall, walleye actively feed during low light conditions and throughout the night. The moon phase can also influence walleye fishing success, with the best night time fishing occurring under a full moon. Once again, search the points and adjacent flats on the lower one-third of the reservoir at dawn, dusk or at night for shallow water feeding activity. Cool weather walleye feed on a wide variety of prey items, including blueback herring, shad, yellow perch, bluegill, minnows, and crayfish. During the fall months, walleye will typically bunch up around downed trees and other structures in 20 to 40-feet of water, especially in the outer bends of the river channel. Anglers should nibble around the edges of these structures with a small jig that is tipped with a minnow or nightcrawler. Trolling with live herring or deep-diving crankbaits is a secondary option at this time of year. From December through February, water temperatures on most north Georgia lakes dip into the mid to low 40s. Cold winter temperatures reduce a fish’s desire to feed. For those brave enough to endure the cold, live baits presented around bottom structure at depths from 30 to 60-feet, especially near the dam, can produce a few strikes. 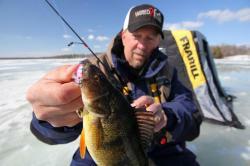 Although winter walleye may be bunched up, they are largely inactive. Patiently dangling a live herring or medium shiner or even a jigging spoon in front of their nose may be sufficient temptation to draw a strike. If one fish is caught or located, you can be sure that others are nearby. The key to successful winter fishing is to work your baits slowly around every nook and cranny of bottom structures. 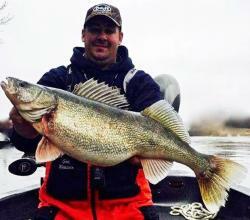 In late winter, warm rains can concentrate walleye in tributary areas of the lake. Tributary runoff is often a few degrees warmer than the main lake and sometimes more turbid in color. These conditions are favorable to the baitfish that walleye prey upon. 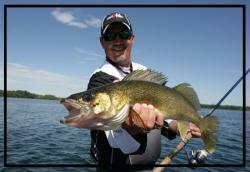 Follow the warming water to the bait and you will find the predators, including walleye. This entry was posted in Walleye and Sauger, Where To Fish on December 10, 2018 by ronniegarrison. 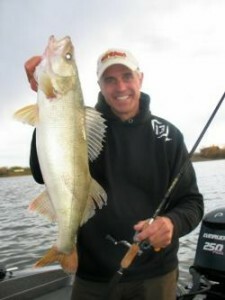 Based in Walker, Minnesota, noted fishing authority and outdoor communicator Chip Leer, www.chipleer.com, operates Fishing the WildSide, which offers a full suite of promotional, product development and consultation services. For more information, call (218) 547-4714 or email Chip@fishingthewildside.net. This entry was posted in How To Fish, Walleye and Sauger on March 27, 2016 by ronniegarrison. Should I Use A Bait That Makes Noise to Catch Walleyes? Anglers across the Walleye Belt keep commotion to a minimum to avoid spooking skittish walleyes. But there are times when silence isn’t so golden. In fact, making a little noise can often help you catch more fish, year-round. 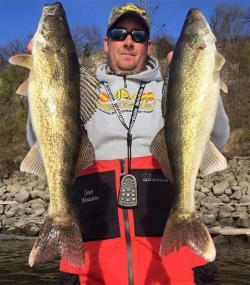 “We’ve been taught that stealth is critical to success, but there are many situations where using sound to attract walleyes can increase your catch rates,” says veteran guide and tournament champion Scott Glorvigen. 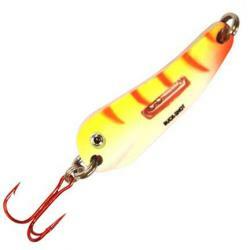 Rattling spoons attract a variety of gamefish including jumbo yellow perch, walleyes, pike and more. In a similar manner, he says rattling lures pique a wandering walleye’s curiosity and encourage it to move in for a closer look. Besides luring fish within visual range of your wares, Glorvigen says rattling tends to attract the most aggressive ‘eyes in the neighborhood. “The ones that are most active and likely to strike,” he adds. “And even if they don’t hit the noisy jigging presentation, incoming walleyes will often slam into a more sedentary bait positioned a few feet away, like a live minnow on a dead rod,” he continues. Glorvigen has been a firm believer in the power of sound ever since watching Northland Fishing Tackle founder John Peterson use a prototype of the Buck-Shot Rattle Jig during an In-Fisherman Professional Walleye Trail tournament years ago. “We were up on Lake of the Woods, and John absolutely put on a clinic, catching fish after fish amidst a crowd of other anglers who were struggling to get bit with traditional silent jigs,” he recalls. Following Peterson’s lead, Glorvigen used sound to win the 2004 PWT Championship on Houghton Lake, Michigan. “Using rattle beads on my nightcrawler rigs was key to catching enough fish in the lake’s turbid water to win the tournament,” he says. Glorvigen trolls rattling crankbaits like the Deep Walleye Bandit to draw scattered walleyes within striking distance. When jigging, Glorvigen recommends a slow, shake-rattle-and-roll approach that gives fish time to move in and locate the jig. “In more open water, you can move a little faster,” he notes. He also encourages anglers to experiment with lure styles pigeonholed to a specific season or situation. “For example, we use lipless rattlebaits like Rippin’ Raps, Cordell Spots and Rat-L-Traps through the ice on big-water fisheries like Lake Winnipeg all winter long,” he begins. Toward that end, Glorvigen advises anglers transitioning from late-ice to early open-water opportunities to keep their winter weapons handy. This entry was posted in How To Fish, Walleye and Sauger on March 12, 2016 by ronniegarrison. How Do They Track Lake Erie Walleyes? For about six years, students in Ohio State University’s Stone Lab’s Research Experience for Undergraduates (REU) Scholarship Program have participated in a multi-state walleye movement and mortality study in Lake Erie. Using acoustic telemetry, researchers from the Ohio Department of Natural Resources (ODNR) and similar agencies across the region are tracking the movement of fish including Walleye, an important sport fish, to better understand how the fish travel throughout the lake during their life cycle. In a contributing project funded by Ohio Sea Grant, ODNR researcher Dr. Chris Vandergoot is implanting acoustic trackers into Walleye spawning below a dam located in Ballville Township, just outside of Fremont, Ohio. The trackers in the fish, along with receivers placed throughout Lake Erie and neighboring lakes and streams, act much like the E-ZPass system in place on many U.S. turnpikes. Students in Stone Lab’s Research Experience for Undergraduates (REU) Scholarship Program have worked with the Ohio Department of Natural Resources on tracking fish in Lake Erie for about six years. Many have gone on to present the research at conferences, or to jobs in similar fields. When combined with data on each individual fish – they’re aged and sexed when the transmitters are implanted – researchers can determine where fish go between spawning seasons, whether they return to the same spawning location, and if they spawn every year or take “reproductive holidays” on occasion. Receiver data is shared on the Great Lakes Acoustic Telemetry Observation System (GLATOS) website, along with general information about the research projects and instructions for anglers who find a transmitter tag in their catch. 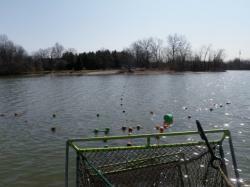 Of course, the researchers aren’t just digitally following fish around the lake for fun. “This is very cool science stuff, but at the end of the day this needs to be able to address management questions,” Vandergoot said. Spawning site fidelity – whether fish return to their “home” stream or reef to spawn – is an important consideration when making management decisions concerning sport fish like Walleye in Lake Erie. For population modeling purposes, it is important for biologist to understand the origin of Lake Erie Walleye as well as where they go over the course of their lives. Stone Lab REU students have participated in research related to GLATOS for about six years, examining everything from how to best anesthetize a fish for the transmitter implant surgery to how well fish survive after being released back into the lake or after the stress of a spawning season. The REU program allows students to work one-on-one with professional Lake Erie scientists on an independent research project while taking a Stone Lab course. Selected students receive a full scholarship to Stone Lab, including room and board, and often go on to present their projects at academic conferences, giving them a head start on graduate school or science careers. One of those students is Zach Steffensmeier, currently a junior in environmental science at Duquesne University in Pittsburgh. During the summer of 2015, he worked with Vandergoot on a Fisheries Management REU, analyzing transmitter data and assessing Walleye mortality during spawning seasons in 2013 and 2014. 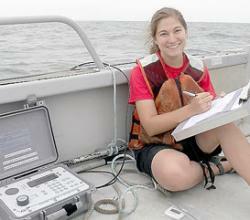 In addition, he was able to work with ODNR staff to collect receiver data in western Lake Erie. In addition to gaining experience in hands-on research and delivering a scientific presentation, the REU also solidified Steffensmeier’s goal to work in the same field in the future. And with recommendation letters from Stone Lab and Ohio Department of Natural Resources staff, he’s well on his way to one of those careers. The larger GLATOS project involves agencies in Ohio, Michigan, Ontario, New York and Pennsylvania, as well as the Great Lakes Fishery Commission and the United States Geological Survey’s Lake Erie Biological Station, and funding from the Great Lakes Restoration Initiative (GLRI) and Ohio Sea Grant. Overall, close to $1 million in assets are involved in this fisheries management effort. This entry was posted in Conservation, Walleye and Sauger on February 18, 2016 by ronniegarrison.